If you're a customer of the Lone Star National Bank in southern Texas, you may have participated in a pilot program for OnDot Mobile Card Services, a new app that allows you to remotely manage your prepaid, debit and credit cards using your smartphone or similar device. Over the year that pilot lasted, the bank saw its card fraud expenses plummet by 60 percent. Bar purchases from certain categories of merchants. Sync it with your smartphone's global positioning system (GPS). If someone tries to use your card in a different location from your phone's, you'll receive an alert showing where the purchase is being attempted. And that might allow you to prevent a fraud. This sounds like a genuinely useful innovation that could bring peace of mind as well as fight crime. Unfortunately, there's a snag: You can't just download the app. 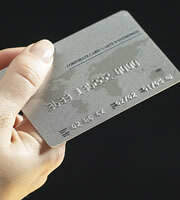 According to Wired magazine, the company behind the service has opted to sell it only to banks and other card issuers. So, as a consumer, you just have to hope that your providers of financial services decide to adopt the system and offer it to you. 0 Responses to "New app locks up your credit cards"